Today we’re releasing the last of eleven PodPlays podcasts. This one is a little different: a DIY primer. This specialpodplay is a “bonus track” for subscribers to the 125 Bundle. It’s not too late to subscribe! Sign up now and receive all 11 podplays in one fell swoop. And come by Hogan’s Alley Cafe on September 24 and 25 to hear Joy Russell’s DAYS OF OLD as part of the Hogan’s Alley Poetry Festival. This fifteen-minute walk will guide you through the space between now and then. Click HERE to hear a clip. I’m working on the next and final podcast for Neworld’s PodPlays series. The podcast is a DIY primer on making your own podplay. All this with the hope of inspiring you, Dear Listener, to create your very own podplay. It’s happening already. Joel Stephanson and Quiet Hum Theatre are producing CORRIDORS, a new podplay that you can experience prior to seeing a show at Pacific Theatre. It’s really inspiring to see folks take on a idea and make it their own. I truly believe that there are more stories than we can ever hope to commission plays for, so I wanted to find a way to put the means of production into the hands of the people – so to speak. Which brings me back to the podcast. I’m asking the artists who worked on the ten podplays we’ve produced so far to share some of their creative strategies. I’ve received some great responses and advice over email from Jan Derbyshire, C.E. Gatchalian and Noah Drew. So much advice, that I can’t fit it all into the podcast. So I’m sharing some here. The route: What do you look for when choosing a route? How did the story relate to the route? NOAH DREW: Since Podplays are, in a sense, a view with a soundtrack and a story, I think the best routes are really great views. It also helps the sense of drama if there at least one major change in the landscape during the play. Instructions: was there an approach or image that worked for you when receiving the directional instructions? ND: I’m a fan of the direct address instructions. When a character speaks right to me, the listener, I feel very included – plus it’s harder for me to miss an instruction when it’s directed right to me than when a character speaks the instruction to another character. C.E. GATCHALIAN: i have to say, the directional instructions were probably the trickiest part of writing the podplay. because with the directional instructions you have to meet two objectives that may appear to be mutually exclusive: 1. making sure that the instructions are as clear as possible to the listener so they don’t get lost; 2. making sure that the instructions are an organic part of the narrative, that they don’t just appear out of the blue with no connection to the story. 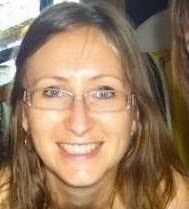 JAN DERBYSHIRE: So yeah, when I first experienced the other podplays I thought a Guide Dog would be a great device for travelling through one of these stories. The guide dog thing wasn’t new. I have this thing about guide dogs, like what if they weren’t just for difference in sight? I could use a guide dog because I feel so blind to so much of what’s really going on in the world. So my Guide dog would help me read people’s energy or something and intuitively steer me away from some situation that maybe I couldn’t handle that day. Anyway, sometimes you have an idea hanging around for a long time that finally finds a home. That’s what happen with the Guide dog in the podplay. Composing: What’s your best advice to composers and writers when thinking about including sound an music? ND: In a way, podplays are just a narrative extension of listening to music on an iPod while walking through public spaces. Althrough the storytelling functions of the music and sound design are important, I actually think the combination of music and location should be able to stand on its own as an experience. If the listener is looking at a great of afascinating view while hearing coold sounds, they’ll be excited and engaged. Rewriting: best advice to writers who need to rewrite? CEG: Enjoy the ride–or in this case the walk. ;-) Rewriting is where it happens, where you have to get tough with yourself as an artist and show what you’re made of. In the end, there’s nothing more rewarding. JD: I need time between my drafts, a few days at least. I put the script in a drawer and then I can take it out like it’s not even mine and be very objective about it. This is counter intuitive to me. I think I should keep obsessing about it and stay up for weeks deeply questioning each comma and consonant. (Vowels rarely give me trouble). But I have found this obsession makes my writing stiff so I don’t do it anymore. Rewrites for me focus on getting to the clear and the necessary. By the clear I mean, I have to ask my words, “Are you being clever just for clever sake? Is this clever in the way of the story? I also need to ask each line of dialogue, “Are you who should be saying this? Why? This is because I’ve learned in my early drafts everybody sounds like me and then I have to go through and ask, “Are you talking as yourself or as me. ?” Often I find the wrong character is saying something that the other guy should or that what’s being said needs to be there but it’s in the wrong place. This is because when the story comes I just race to get it down and then figure it out later. Also I was taught to not argue in the moment about notes. Just write them down and say thank you and then figure out which ones are useful. Sometimes when you’re working with people you really trust you can tell right away that a note is golden. That said I think it’s important to work with skilled dramaturges who are interested in helping you get to the story you want to tell and not in making suggestions for a story they want to tell. One final note- I always ask if the writing is working with the form. This is really important I think in the experience of podplays. I may have a great story but it’s clunky in this form. To make it work might require cuts and changes that I might not normally consider. I try to stay playful right through brainstorming to final draft. I bounce a ball a lot when I walk around to remind me not to take myself too seriously. What do you know now that would have helped you when you started writing your podplay? CEG: Two things: 1. How crucial the directional cues are to the form. 2. That there has to be a reason why this walk is happening right now. You can’t just be telling a story while doing the walk. The walk has to be an integral part of the play. And there has to be conflict and tension in the present of the play, not merely recollected. ND: You’ve got to consider the noises implicit to your route as well as the visual landscape. 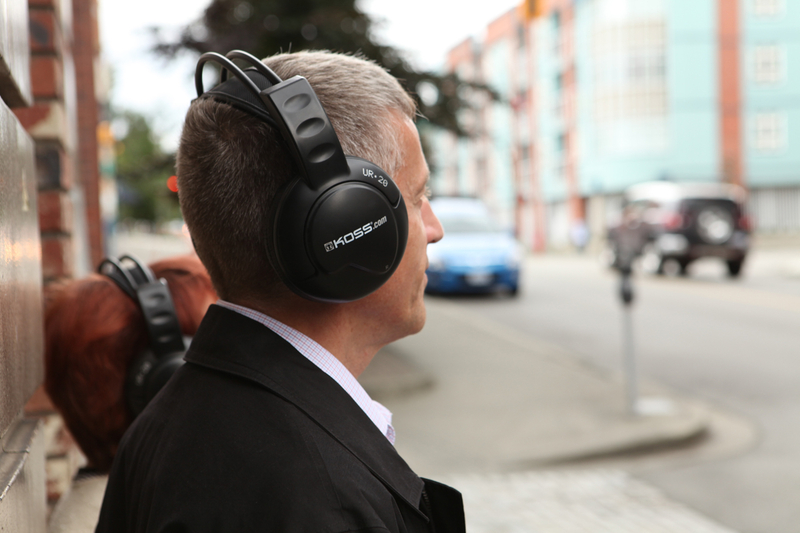 If you’re overlooking an incredible view but listening to noisy traffic, the moment won’t work very well. These plays are intimate experiences – they’re right in your ears! Finding public spaces that have some sense of intimacy/quiet works best. JD: Honestly, nothing. The sharing of experience from the podplay teams that produced their work before us was so helpful . A lot of bugs had been worked out with the limitations and the strengths of the form. Those of us who came later had more room to play. Posted in Uncategorized | Comments Off on If we knew now…. When I saw the route that Adrienne prescribed for my podplay, I was delighted. The progression of spaces, and the variety of sensations a body might encounter negotiating the play’s vector were quite exciting to me. On walking it the first time, I found it to be so rich in structural conflict that I felt it would be irritating to have a narrative added to my ears on this journey. I went with that impulse and imagined an irritating person talking to me non-stop as I walked. Someone you might meet in a bar, and perhaps were trying to escape from. A man whose endless narratives just might contain something important you or he needed to hear. That the tangents of his stories might eventually come together in some illusive moment of recognition. I wrote some text, got a friend to walk with me, and recorded different versions of it. Some of myself reading it, others of my friend repeating lines that I yelled to him while walking the actual route. Experimenting. I dumped these onto an ipod and started walking the route regularly. It was then that I realised I had a problem with the form. It irritated me. I never walk around with headphones. They give me a headache and they act as a shield or a mask separating myself from the world around me. It’s not just that I fear death from inattention, I also feel uneasy about the imposition of pre recorded words or music on an environment. It’s an easy use of technology that graces you with a self-arranged sense of privilege. I can be here and look around me, but I am separate. For others to engage me, they will have to interrupt my progress, which doesn’t include the aural immediacy of our actual shared existence. It’s an act of individual colonialisation. An intimate, exclusive imposition on the world around you. As a form, a Podplay purports to take its audience into the world and encourage them to engage with the here and now, but its realisation in performance creates an unresolvable contradiction. The form removes you from the here and now by asking you to engage in a scripted intimacy with the voice transmitted to your head. Irritating. I think this irritating contradiction is the forms greatest strength. How does the listener negotiate the intimacy of the transmission and stay present in the world. The agenda in your ear requires your body act as the conduit to the world that the voice speaks of, while simultaneously removing your sense of it. How much are you going to resist or give in to this scripted intimacy? How present can you be? For me, the site of the podplay performance becomes the body of the listener negotiating all these contradictions. That negotiation and struggle, recognition and denial, becomes the content of the work. I like to be irritated. Deeply irritated. If art doesn’t irritate me on some level, I am bored. If not angry. Very very angry. All of which is better than entertained. I find it insulting to be entertained. I did David Leddy’s podplay “SUSURRUS” in Glasgow’s botanic gardens. It really irritated me. I full-on despised the whole thing till 30 minutes into it I found myself streaming with tears. My body had to acknowledge the beauty and love in the twisted constructs of the world around me. It was a deep irritation. I happened to run into Mr. Leddy at a bar later that night and I was able to tell him how deeply I hated his work and all the tangental reasons for my deep irritation. He remarked that I had brought a lot of baggage to his work. But of course that is unavoidable when the site of performance is your body. I hope your body finds my work at least a bit irritating, even though Mr. Murphy found some beauty in it and gave me three lovely songs. I deeply enjoyed the irritations of making it. —David McIntosh is a writer, singer, and the artistic producer of battery opera. In 1995 he co-founded battery opera with Lee Su-Feh, whom he began collaborating with shortly after he was run over while on his bicycle somewhere between Kuantan and Kota Baru. Subscribe to his, and more podplays, until September 30th, 2011 HERE. This week’s podplay, Five Meditations on the Future City, premiered as part of The Quartet at the 2011 PuSh Festival. If you missed that series the first time round, you are now in luck. We received a lot of great feedback on the event. Below is an excerpt from an email sent by Joel Stephanson, an artist associated with Pacific Theatre. Joel is working on his own podplay event that will come out later in September. His email gives you a sense of the serendipitous events and magical coincidences that help to make podplays such a unique experience. I had a truly amazing time with your PodPlays last week! I wonder if any other key lessons have come to you in the execution of it, from the artistic or production side of things. I definitely learned valuable stuff during my walk. I couldn’t believe how many serendipitous moments there were. At times I just stood there and said, “you’ve gotta be kidding me”. There was this strange confluence of your work and my truly random circumstances…. A homeless guy who was having a (hallucinatory?) episode wandered ahead of me at Main & Alexander, and would stay in the vicinity for the next 25-30 minutes of my route. He even took on a role at a couple points. Standing on the beach facing the water, I think the voice told me to face my palm forward in a waving gesture. I looked over at Homeless Guy to find he, too, was looking at his own hand out in front of himself. Both of us in our own worlds, likely both hearing voices in our heads. At the moment the play mentioned “Sean Connery standing on the bridge,” he was standing over on the pier, arms up in majestic, if drug-induced, gesture. Another occasion, the voice speaks of how we are each individual agents, as a flock of runners passes me by, as if to illustrate the point. I guess I describe all this because my experience allowed for this remarkable interaction with the outside world. It made me want to ensure that I let the surroundings do their work in my own podplay, and work with them as much as I tell stories about them. Thanks again. Joel Stephanson is an actor and writer. His own podplays project, Corridors, will be running on Fridays from late September, in a century-old church building. Tickets available through Pacific Theatre. Podplays podcast subscriptions are still available. You will receive all the podplays issued up until now (that’s eight, including this week’s podplay) PLUS three more plays and one bonus track delivered weekly between now and Sep 19. Go to www.neworldtheatre.com to subscribe before Sept 30. Did you miss PodPlays at the 2011 PuSh Festival? Never fear! We are re-issuing all four as part of the Retro Bundle. That means that every Monday between today and September 12 Neworld will podcast one podplay from The Quartet. Now you can listen to them at your convenience, as many times as you like. And it’s not too late to hear the new podplays, The Celebration Edition. The podplays are available to subscribers until September 30th. If podplays are new to you, we are re-posting an article by Sarah Banting, which gives you a really good idea of how they work. Created by Adrienne Wong & Joelysa Pankanea, Proximity Arts, David McIntosh & Max Murphy, and Martin Kinch & Noah Drew. Let’s say I deliberately chose one of the chilliest wet days of a dark December to preview PodPlays – The Quartet. Dusk, too: the growing dark must have been my idea. That gives me a measure of creative control, making me director of mood and wardrobe in this new site-specific piece for solo audiences. Damp gloves, hoodie, umbrella. Gloomy sea-coast city. iPod. I’m set. The weather affected my experience of these four short plays, of course, and whatever the day is like when you take them in this month or in early February, it will affect yours. Look forward to it. Because these are audio pieces, downloaded onto your mp3 player* and piped in by your earphones, they unfold as if from inside your head. They are so intimately with and within you, as you walk along listening to them, that it’s your body that brings them into contact with the world. Your skin, chilled or sunlit. Out there alone in our Vancouver, as the night fell too early, the rain and cold made me feel how exposed I was to the elements of this specific place. But at the same time I was secretly a capsule containing voices and soundscapes. I was buoyed up and protected by what I heard, warmed and secured by this good company. I’m tempted to say too much about the content and precise map of the PodPlays: the plays are each moving and thoughtful, in their quiet but insistent ways, and the experience of being guided by them around the fringes of downtown, through doors and passageways I had never seen before, gave me plenty to think about. The histories and futures of this city. Colonial guilt and greed. Our strained relationships with those we love, or once loved. The feeling of being in city space. Not wanting to spoil it for you—though perhaps that would be impossible? Your experience will be different than mine—let me comment instead on just one of the remarkable things I think theQuartet does to temporarily transform the experience of living in a city. Landmarks are clearly an important part of how we map our worlds. And, although some of them may be private, we necessarily also use landmarks in our attempts to coordinate maps with others.Can you tell me how to get to the Woodwards Atrium? Well, if you’re coming from the east, follow the big W… Living in densely populated places, we are aware that many other people share landmarks with us. Especially major landmarks: the stand-out features of the street grid. But each of us knows a different version of the city, so it can take some explaining to orient friends or strangers to the little landmarks in a neighbourhood that’s new to them. What do you see around you?, we say into our phones. Okay, you’re almost there. Just keep going past the Nestors. The PodPlays guide you—expertly, I think—along their four consecutive routes using little landmarks. 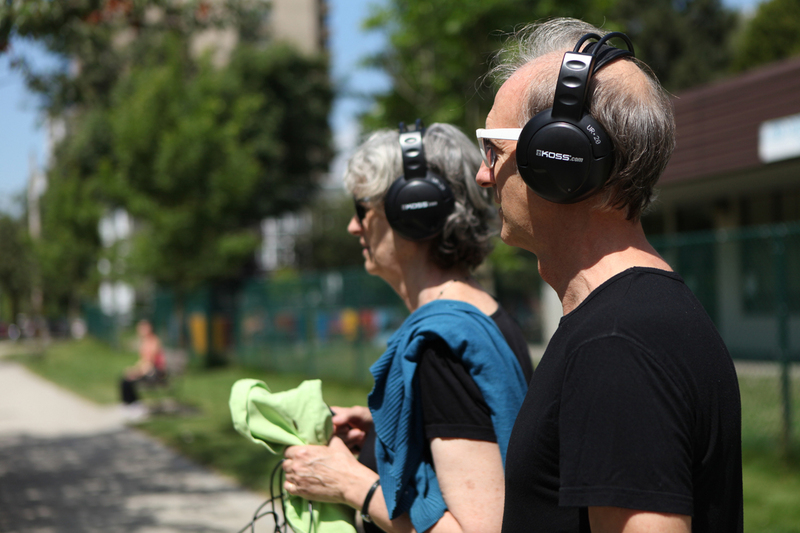 Each play does it slightly differently, depending on who is speaking, and whether the voice is addressing you directly or guiding someone else along a path through the city, while you listen in and follow along. Do you see that building that looks like a flying saucer?, asks one voice.Keep walking towards it as it fades from view. Another voice instructs you, encouragingly, to see something you hadn’t yet noticed, picking it out for you from the view ahead, so that you may move towards it. See the restaurant’s black terraced railing jutting out into your path. Lean forward over the railing. Peer in the windows. Don’t stare. I’ve done research, recently, on how Vancouver landmarks get mentioned in theatre and fiction set in this city. What strikes me, in many cases, is how conspicuous and deliberate these mentions sound—how conscious they are of their varied audiences, some of whom might recognize the landmarks, some not. The Second Narrows Bridge!, a play or novel will say, importantly. Stanley Park! Main and Hastings! Mentioning these major landmarks is almost a political act: it coordinates maps at a grand scale, pointing out that there is an audience out here that recognizes and identifies with these places. We are Vancouverites! What the PodPlays do is to invent a new kind of very little landmark, one that does not depend on your prior knowledge of the city. (Usually, in fact, when they weren’t taking me through a part of the city I’d never yet seen, they were coaxing me to look at familiar places from a new angle.) To move you along their winding path they give directions by offering some immediate feature of the world around you as a point of orientation. They mention these new landmarks in the most make-shift of terms. Do you see that door straight ahead? The letter R. That’s where we’re headed. No official capital-letter place names here, names that might be marked on a map. Instead, they are simple, general nouns—descriptive, yes, but stripped down to the fewest words possible—which should for those reasons be vague directions except that, in the circumstance of these plays, they are absolutely, spectacularly precise. They are what sub-local knowledge you share with the voices of these plays. They are just what’s suddenly right there in front of you. We’ll go in here, underneath it, the service tunnel straight on. The arrow points right but go straight on, just watch out for the traffic. I felt oddly secure, as I experienced the PodPlays. I felt taken care of, gently guided by voices that knew just where I was, because they were there with me. There it was, the arrow. My eyes found it just as they said those words. The service tunnel. I get it! I was a solitary body wandering along the edges of the city. But I was in sure hands: a Gretel following Hansel’s little trail of stones through the weird forest safely home. When I started thinking about “Days of Old,” I was curious about how one engages with the past and how easily it becomes fossilized and disconnected from the present – a certain dysfunctional nostalgia that stunts. I confess I have found myself lured into that landscape until it was an impediment to being in the here and now. Who hasn’t? Then I began to imagine the conversations that might take place between characters with different agendas, complications and discomforts around these time zones. I asked what history would look like as a dynamic organism, a verb fully living in the present. 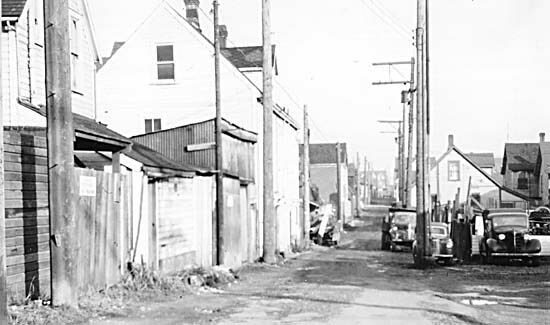 The important and necessary work that is taking place around Hogan’s Alley has involved the process of excavating histories and giving them a palpable and undeniable presence in the city’s psyche. Particularly important, I think, given the number of times people have commented they were unaware that there was, in fact, a black community concentrated in the Hogan’s Alley area in the past. It is an ongoing task pushing this historical presence into the city’s narrative and making visible where erasures previously existed. 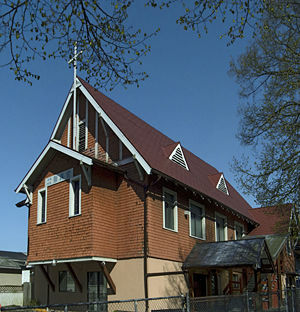 From my observations, there seems to be two distinct camps that engage with the black community that lived in the Hogan’s Alley area: those with a direct, first-hand lived experience of the community and its places, and those of us who are visitors and listeners, retrievers, collectors and gatherers of this history. There are places such as the Harlem Nocturne, The Fountain Chapel, the house that Nora Hendrix lived in, which remain, their old buildings’ skins with new occupants, names and functions, or, the part of Hogan’s Alley which has been destroyed and smoothed over with a dull, green dress of grass. The intersection between these two experiences was compelling to me for a number of reasons, including what it might suggest about generational shifts in proximity to memory. These questions kept itching – I had to scratch and find a way to embody them in the play and characters. In writing “Days of Old” I haven’t come up with any definitive answers or tied everything up with a pretty bow, but certainly have sharpened my thought that how we hold history tells us something about what our future might look like, how we forget tells us how we walk in the present. Here’s more information on Hogan’s Alley. A Memoir. Sort of. – C. E. Gatchalian speaks about Authentic, part 2. Do you remember James Frey? He’s the drug addict-turned-writer who authored A Million Little Pieces, a “memoir” that Oprah selected for her hallowed book club six years ago. A storm erupted when it was revealed that Frey had fabricated much of the stuff in the book. Oprah publicly scolded him and withdrew her endorsement of the book. A similar “is it/is it not a memoir” agon took place in my own head while writing my podplay Authentic. A fifteen-minute audio play. Piece of cake, right? As it turns out, writing Authentic was one of the most challenging experiences I’ve ever had as a writer. When I was greenlighted to write this podplay, the story called to me, despite myself. I’ve always stubbornly clung to the Eliotian ideal of hard, uncompromising impersonality, so writing something as directly autobiographical as what Authentic promised to be smacked of a too-easy surrender to our reality-TV-infested Zeitgeist. But the extreme intimacy of this particular art form lends itself to confessionalism, and it dawned upon me that some not-too-shabby writing also emerged from the gut-spilling, private-life-exposing likes of Berryman, Ginsberg, Roethke and Plath. So, with Authentic, I decided to spill it—guts, ejaculate, what have you—like never before. Meaning: I made no pretense to myself that what I was writing was fiction. Meaning: this play is about my love affair. The central character is me. Writing the first draft was wrenching—I was obsessed with transcribing every aspect of the relationship and every nuance of my thoughts and feelings about it as exactly and precisely as possible. Therapeutically, it was helpful; but it did not make for a good play—certainly not a good podplay. But with each subsequent draft the how took over from the what, and, slowly but surely, I nudged it up into something I could be reasonably proud of. The extreme time and geographical constraints of the form forced me to cut everything that may have been personally meaningful but that, dramatically, was superfluous and unnecessary. Eventually the story came to deviate somewhat from actuality, and details were altered and in some cases invented for dramatic logic and flourish. Suddenly, Mr Frey became something of a kinsman. So, the product is a semi-autobiographical, semi-fictional audio play whose central character is mostly me and partly not me, dealing with a New York lover who is mostly my actual New York lover and partly other lovers/would-be lovers/imaginary lovers/friends/acquaintances. So here is Authentic. A memoir. Except I’m small-fry compared to Mr Frey and will fortunately never get into trouble for calling it that. Posted in Uncategorized | Comments Off on A Memoir. Sort of. – C. E. Gatchalian speaks about Authentic, part 2. 1. Go to the Neworld website and subscribe to one of our podplays packages below. The Celebration Edition is for those who attended PodPlays at PuSh and only want to purchase the five new podplays. The Retro Bundle features the four plays from PuSh and one from the Powell Street Festival. The 125 Bundle has all 10 plays – plus one bonus track! Clicking SUBSCRIBE NOW will navigate you away from the Neworld website to our Nanacast site. Payment is accepted via PayPal. 2. Choose your podcast player. Launch iTunes on your computer. You will find your subscription under “podcasts”. Click “Get All” to download every podplay released between July 8 and today. You will have to repeat this step once a week to download the newest podplay, that’s one per week week until September 19th. The podplays are online until September 30th. That means if you sign up on September 29th you won’t miss any podplays, instead you receive all the podplays at the same time. You are in charge. You can walk any of the podplays, any day, any time of day. It’s up to you. Once you have downloaded a play, it’s yours to keep and listen to over and over. Contact us at info@neworldtheatre.com or 604-602-0007 (M-F, 10-5), we’re happy to help. Posted in Uncategorized | Comments Off on How Do PodPlays Work? What On Earth Is A PodPlay Anyway? Games and email, is that all your iPhone seems to be good for these days? What about getting a new perspective on your own city? Local theatre company Neworld Theatre (yes, that’s us!) is asking iPhone users to plug in for a completely different experience of the city? (It works on iPod and mp3 players, too, btw.) Sure we all know what it’s like to listen to tunes on the bus or while jogging. But what if instead of random music, you listened to a audio play designed for the specific walk you’re taking? Including “turn left at that tree” kind of instructions? It’s almost like listening in on someone else’s thoughts. PodPlays is an eleven-part podcast anthology series featuring short audio plays about urban living in Vancouver. Each podplay is also written for a specific place in downtown Vancouver. It’s like walking in someone else’s shoes. Ya, you might learn something about the history of the city, but you also might just experience familiar places in a cool, different way. And it is all dependent on mp3 and podcasting technology. “This kind of project just wouldn’t be possible for us even five years ago,” says Adrienne Wong, writer of two “podplays” and the creative force behind the project. “Now all you need is a Macbook with Garage Band and a good audio recorder to make a podplay. It’s easier than ever to podcast, and the playback devices are everywhere. The guy who doesn’t have an mp3 player is the exception, not the rule.” Subscribers sign up through the Neworld website (http://www.neworldtheatre.com/productions-podplays.html). They can choose to have the podcasts beamed weekly into their iTunes podcast folder. Once a week they get a new play featuring a new walk. It’s as easy as that. Podplays are hard to pigeon hole. And they are not for the faint of heart. 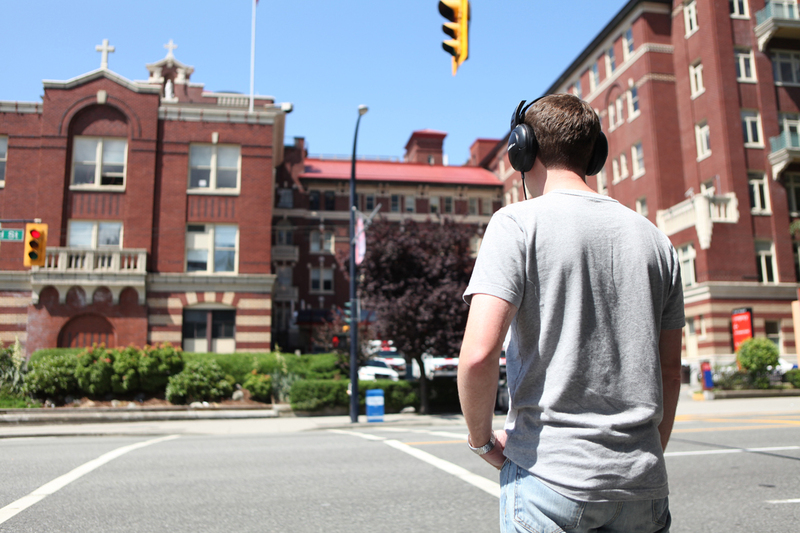 Podplay listeners have to navigate parts of downtown Vancouver they might not be familiar with. They are definitely for the adventurous who want to discover new places – or rediscover favorite haunts. There’s an element of social experiment to the whole project, too. Imagine a family in the 1920’s huddled around the radio to listen to The Shadow or War of the Worlds. These days everyone is plugged into their own audio experience. But listen to a play and suddenly you are an audience of one. Take a friend and you’re on a date! Posted in Uncategorized | Comments Off on What On Earth Is A PodPlay Anyway?